Shutterfly – 250 Free 4×6 or 4×4 Prints + Free 16×20 Print + 2 Free 8×10 Prints! Take lots of pictures for Easter and then get them ordered through this special offer! Through the end of the day on Monday, you can enjoy 250 FREE 4×6 or 4×4 Prints AND a FREE 16×20 AND 2 FREE 8×10 Prints from Shutterfly when you use the promo code HIPPITYHOP at the checkout. (You can opt for 1, 2, or all 3!) Taxes, shipping, and handling will apply. Kohl’s Cardholders – Extra 30% off + Free Shipping + Kohl’s Cash! Last day to shop Kohls.com with these stacking promo codes and earn Kohl’s Cash!! Time to do some shopping and saving on Kohls.com…especially if you’re a cardholder! Through April 20th, cardholders can save 30% off your entire purchase when you use promo code BASKET30 at the checkout…AND you’ll get FREE shipping when you use the promo code APRMVCFREE at the checkout! But it’s better yet because you’ll also earn $10 Kohl’s Cash for every $50 you spend now through April 20th! Now that’s SWEET! Not a cardholder? Use the promo code BASKET to save 20% off your entire online purchase now through April 20th! Bluprint – Up to 60% off Kits & Supplies This Weekend Only! 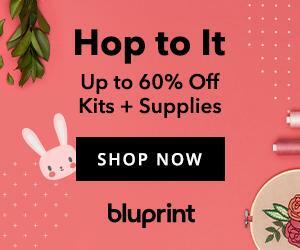 Hop on over to Bluprint and get all the supplies you need and the kits you love and save up to 60% off! This sale is happening through the end of the day on Sunday!